﻿ Static excitation system for large generators – KONČAR Elektronika i informatika d.d. The robust and flexible modular design. The static excitation system is based on a robust modular design, engineered and designed to meet all modes of operation of large synchronous generators. The system is characterized by high accuracy, reliability and speed. 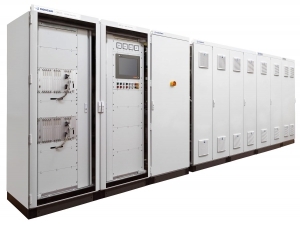 The main characteristics of this system are: dual-channel redundant configuration, automatic voltage regulator, adjustable PID type, excitation current regulator, higher-level control functions (the reactive and active compensation by current generator, the Power Factor Controller / cos (φ) regulator, embedded power system stabilizer (PSS) ), integrated limiter functions, logic and sequence control, the possibility of extending the digital and analog inputs and outputs. Equipment is fully adapted to all operating modes of generator excitation regulation system, protection and communication, according to all important communications protocols. The ideal solution for hydropower plants and thermal power plants. Control of the excitation system is based on the KONČAR’s microprocessor system for the control and regulation of electrical machines adapted for the static excitation systems. The system is built around powerful, programmable central processing unit (CPU) that enable the real time execution of the complex control and regulation tasks together with the high speed, accuracy and reliability.